The Agriculture Ministry’s cancellation last month of the company’s 2010 lease is invalid as it didn’t follow procedure, contravened an investment agreement between India and Ethiopia, and wrongly accused the company of inadequate progress, Managing Director Sai Ramakrishna Karuturi said in an interview Jan. 5 in the capital, Addis Ababa. The government made the “painful decision” to cancel the contract because of a lack of progress, said Ethiopian Communications Minister Getachew Reda. 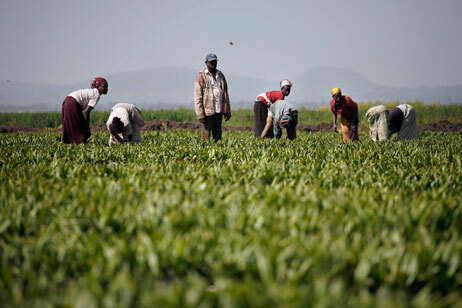 Karuturi, based in Bengaluru, India, was one of the first foreign investors to lease land in Ethiopia after the government offered incentives and identified 3.3 million hectares (8.2 million acres) as suitable for commercial farming. None of the farms have reported any success in exporting crops and advocacy groups including New York-based Human Rights Watch say the program impoverished residents by displacing them. The Agriculture Ministry’s land investment agency notified Karuturi on Dec. 28 that the lease was canceled because “development” occurred on only 1,200 hectares. The rest will return to a “land bank” for investment, it said. The agreement stipulated that all 100,000 hectares of the area allotted should have been developed within two years, according to a copy of the accord given to Bloomberg by Karuturi. The government didn’t provide a final map of the concession, effectively blocked $180-million of financing by enacting a cereal-export ban, and prevented diesel from reaching the Gambella region near the border of war-torn South Sudan in 2014 on national security grounds, Karuturi’s Ethiopia unit said in a Jan. 1 letter in response to the cancellation that it sent to Prime Minister Hailemariam Desalegn. Hassad Food, a subsidiary of the Doha-based Qatar Investment Authority, rejected an offer to make an equity investment in the project in April 2013, two months after it had formally expressed interest, according to letters provided by Karuturi. No one answered the phone when Bloomberg made calls to a spokesman for Hassad Food and the investment authority seeking comment. The clearing of 65,000 hectares and building of 100 kilometers (62 miles) of dykes to manage floodwaters constituted development, Karuturi said. An investment of $100 million is evidence of implementation efforts and annual floods and government action prevented further progress, he said. The ministry officially warned Karuturi about insufficient progress in April 2012 and in June, according to the letter. Karuturi, which says it’s one of the world’s biggest producers of cut roses, planned to grow and process crops including corn, sugar cane and palm oil on the plantation. The company was unable to do so partly because the Trade Ministry’s 2012 refusal to allow cereal exports precluded the company from earning the foreign currency needed to pay back the promised $180 million of loans from Indian banks, Karuturi said. Karuturi has obtained a court order protecting the lease and is prepared to seek international arbitration on the matter, he said.